Baby bath toys are a big part of the development of babies as they become a few weeks old. By that time, they become inquisitive, enjoying melodious sounds, bright sights and pleasurable textures. This is why so many baby toys are based around arousing our five senses. Babies enjoy getting touchy-feely with any objects that attract their attention – and this doesn’t change whilst bathing. Bath activity toys are a great way to keep children preoccupied during bath time – especially those who don’t like baths. Baby toys also provide a bonding experience for the child and parent during the bath. If you can make the activity as pleasurable as possible, then it will make things a lot easier for all involved. Check out our fave baby bath toys for this year. If there’s one thing that babies love, it’s lots of bright pictures. The Playgro Splash Book can be considered their first steps into the world of books – and it’s bath-friendly. 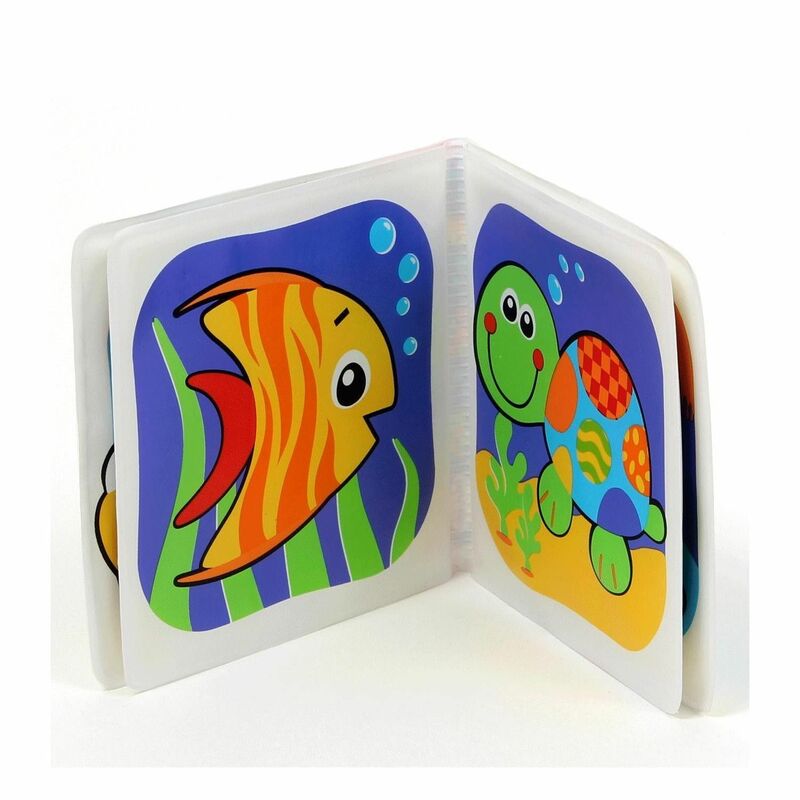 The Splash Book features some cute, colourful aquatic creatures and a squeaker that sounds when the book is squeezed. 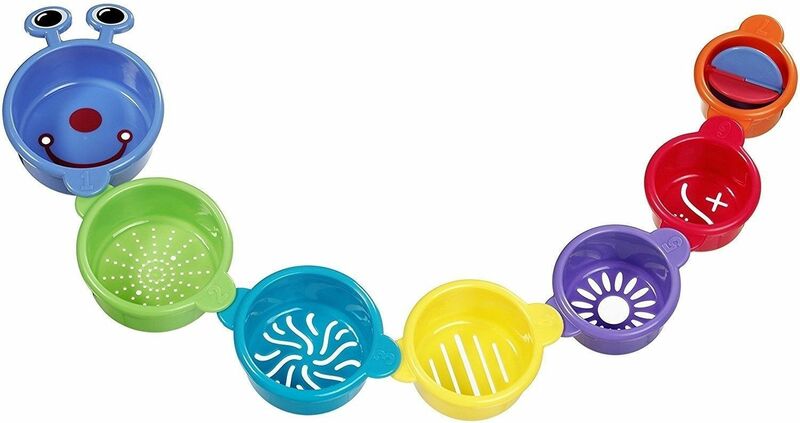 Specially made to be completely waterproof, Playgro have created a bath toy that is safe and durable as much as it is educational and entertaining. Let your artistic tiddlywinks explore their creativity without the fear of being told “no” for once. The best baby bath toys are the ones that can be entertaining without causing hassle once the fun is over. 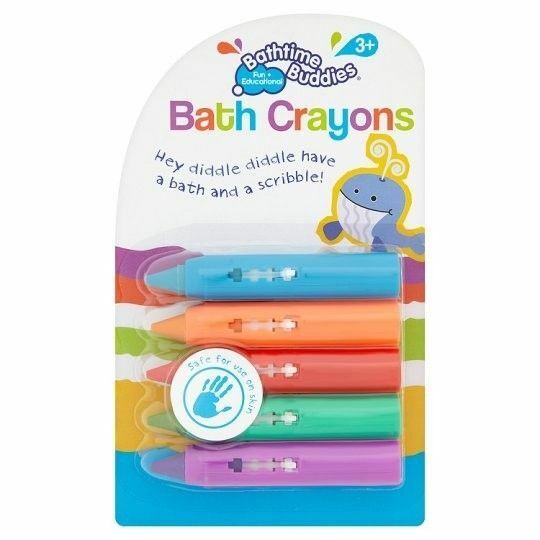 Bathtime Buddies’ Bath Soap Crayons definitely fit the bill. These colourful, washable soap-based crayons come in five colours and provide lots of doodling and scribbling fun. Once bath time is over, simply wash it all away. Bet you wish all your child’s arty stuff were like these baby bath toys, huh? 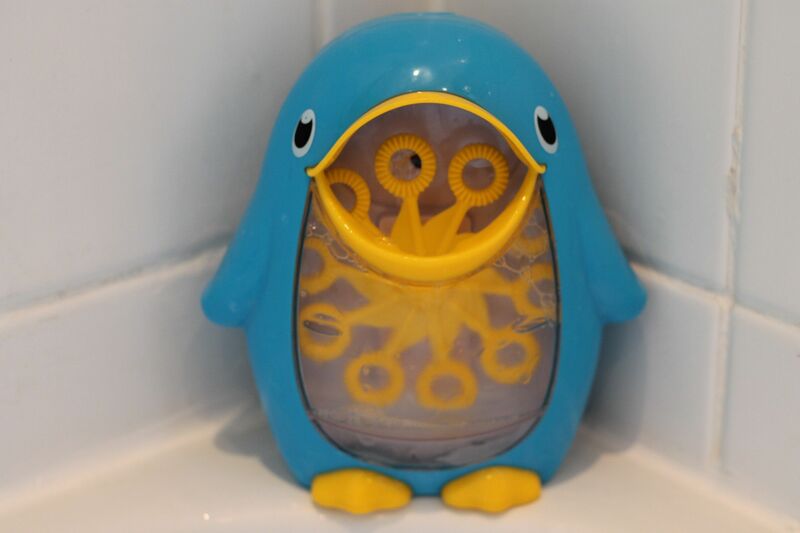 For its simplicity, the Bath Penguin Bubble Maker and Blower is one of our favourite baby bath toys in this entire list. Babies look on in wonderment at bubbles as they float around them and burst at the touch. Munchkin’s Bubble Maker takes the form of a penguin with its mouth open producing a continuous flow of bubbles. Your kid’s new little buddy can be securely attached to bath tubs using the suction cup feet and is completely waterproof. Enter your soapy solution (which can even be bath soap), turn it on and watch it shoot great, big bubbles. It’d be wrong not to have a list of the best baby bath activity toys and not include a water-going vehicle. Our choice is the Bath Time Boat Set from Happyland. The set includes a sailing boat with its captain, deep-sea diver, tug boat, whale and life ring. 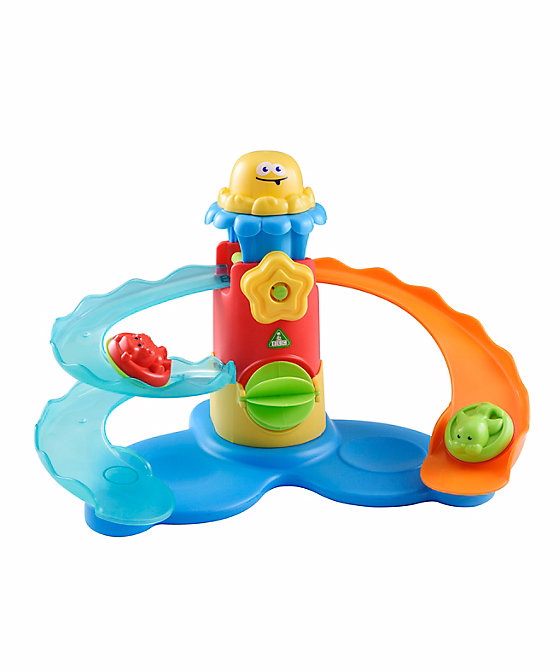 This awesome baby toy makes for great imaginative play as kids create their own sailing scenarios. Some of the parts double as something else – including the ring doubling as a sieve and the whale as a water scooper. There’re so many ways for children to have fun with the Bath Time Boat. Okay – so we love bubble-blowing machines just as much as kids do. Though, this one is just as cute as the Bath Penguin we talked about earlier, it’s definitely an upgrade on it. As bubble-blowing baby bath toys go, VTech’s musical Bubble Blowing Whale has lots of additional features added to the experience. The Whale boasts colourful illustrations, phrases, sound effects and playful sing-along songs for kids to sing to. Babies can learn about colours, animals and instruments whilst they swat at the bubbles. And, with volume controls and an automatic switch off function, this is the most parent-friendly bubble-blowing machine around. Babies don’t always need elaborate baby bath toys that shoot bubbles and lights out of their mouths. Sometimes, just interacting with the water is enough for them to pass time. The Caterpillar Spillers mix water-spilling fun with creativity. The Caterpillar Spiller cups nest inside one another. Once pulled out, the link to create a caterpillar that produces different spill shapes and sizes. Spilling has never been this exciting before. Watch these critters slide into your child’s heart with the Water Slide Bath Playset. This vibrant baby toy comes with two plastic animal characters to send whizzing down the shoots and into the water. On one side, there’s a simple curved side. And on the other, there’s the dizzying spiral slide that always leads to a different SPLASH! Mothercare’s clever playset is a great way to teach hand-eye coordination and cause and effect in an imaginative way. Bath time is a great time to read a story. 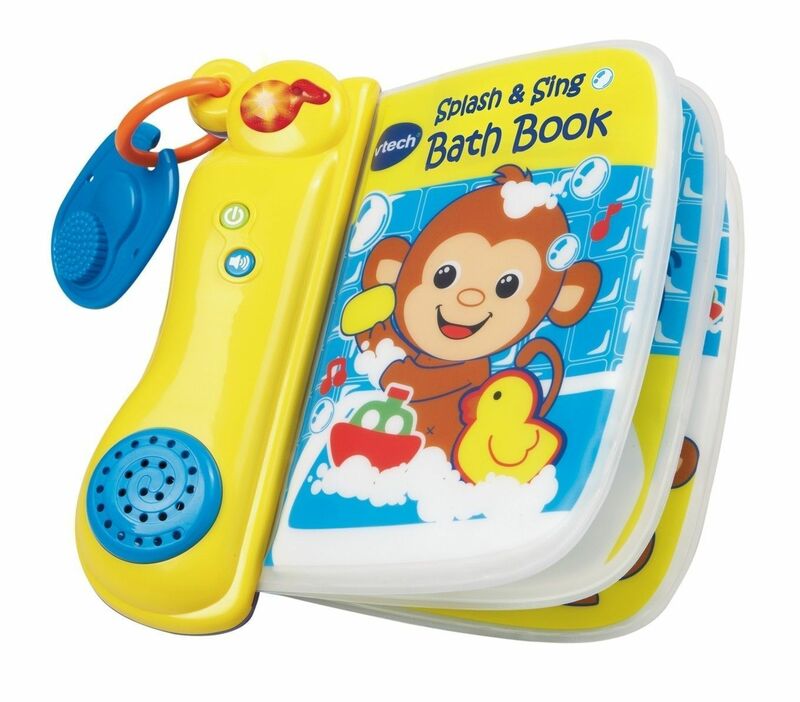 The Splash and Sing Baby Bath Book is the perfect story time baby bath toy. This toy is more than just a waterproof book. Its soft pages also feature triggers that set off sounds and songs to sing along to and learn. Before you know it, kids will be educating you on the different numbers and body parts. With over 20 phrases, sounds, melodies and songs, the Splash and Sing Baby Bath Book takes bath times to a whole new level. When your child is all clean and partied out, you’ll need somewhere to store all those awesome toys you’ve been splashing around with. 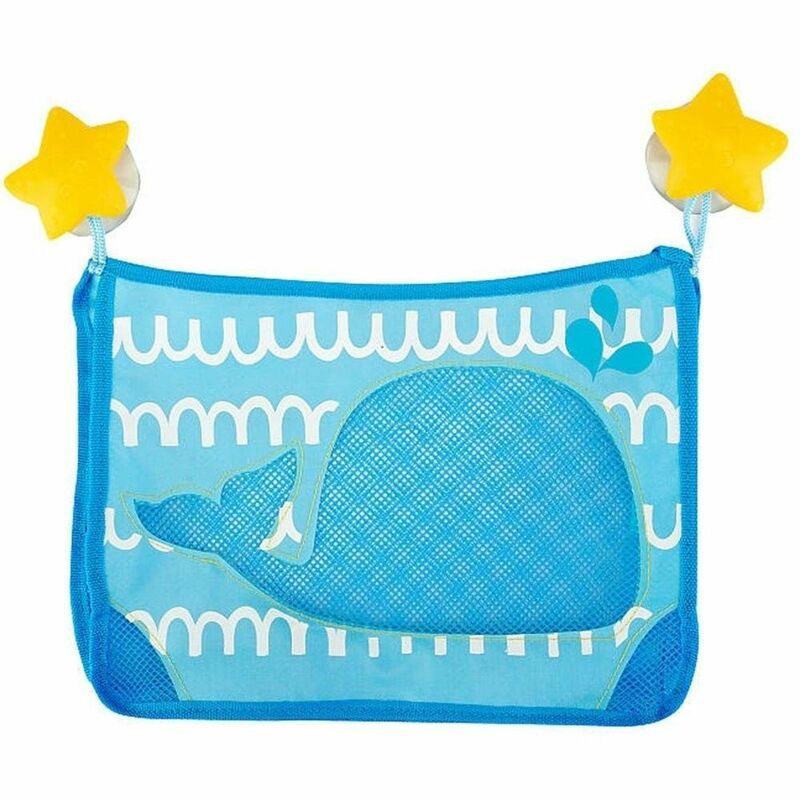 Here’s a cool bath toy bag to keep all of your baby bath toys in till next time. It’s spacious, practical and has an amazing whale and wave print on it to boot. The cutest way to end the splashingly fun day. Attaches using suction cups with star-shaped cut-outs.